GtkScrolledWindow is a GtkBin subclass: it's a container the accepts a single child widget. GtkScrolledWindow adds scrollbars to the child widget and optionally draws a beveled frame around the child widget. The scrolled window can work in two ways. Some widgets have native scrolling support; these widgets have "slots" for GtkAdjustment objects. Widgets with native scroll support include GtkTreeView, GtkTextView, and GtkLayout. For widgets that lack native scrolling support, the GtkViewport widget acts as an adaptor class, implementing scrollability for child widgets that lack their own scrolling capabilities. Use GtkViewport to scroll child widgets such as GtkTable, GtkBox, and so on. If a widget has native scrolling abilities, it can be added to the GtkScrolledWindow with gtk_container_add(). If a widget does not, you must first add the widget to a GtkViewport, then add the GtkViewport to the scrolled window. The convenience function gtk_scrolled_window_add_with_viewport() does exactly this, so you can ignore the presence of the viewport. The position of the scrollbars is controlled by the scroll adjustments. See GtkAdjustment for the fields in an adjustment - for GtkScrollbar, used by GtkScrolledWindow, the "value" field represents the position of the scrollbar, which must be between the "lower" field and "upper - page_size." The "page_size" field represents the size of the visible scrollable area. The "step_increment" and "page_increment" fields are used when the user asks to step down (using the small stepper arrows) or page down (using for example the PageDown key). If a GtkScrolledWindow doesn't behave quite as you would like, or doesn't have exactly the right layout, it's very possible to set up your own scrolling with GtkScrollbar and for example a GtkTable. The two arguments are the scrolled window's adjustments; these will be shared with the scrollbars and the child widget to keep the bars in sync with the child. Usually you want to pass NULL for the adjustments, which will cause the scrolled window to create them for you. 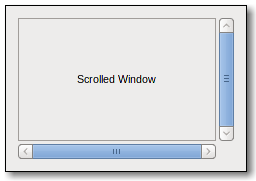 the horizontal scrollbar of the scrolled window, or NULL if it does not have one. the vertical scrollbar of the scrolled window, or NULL if it does not have one. The policy determines when the scrollbar should appear; it is a value from the GtkPolicyType enumeration. If GTK_POLICY_ALWAYS, the scrollbar is always present; if GTK_POLICY_NEVER, the scrollbar is never present; if GTK_POLICY_AUTOMATIC, the scrollbar is present only if needed (that is, if the slider part of the bar would be smaller than the trough - the display is larger than the page size). A widget supports scrolling natively if the set_scroll_adjustments_signal field in GtkWidgetClass is non-zero, i.e. has been filled in with a valid signal identifier. Unsets the placement of the contents with respect to the scrollbars for the scrolled window. If no window placement is set for a scrolled window, it obeys the "gtk-scrolled-window-placement" XSETTING. There are no public fields in the GtkScrolledWindow struct; it should only be accessed using the functions below. Whether "window-placement" should be used to determine the location of the contents with respect to the scrollbars. Otherwise, the "gtk-scrolled-window-placement" setting is used. which gets emitted when a keybinding that scrolls is pressed. The horizontal or vertical adjustment is updated which triggers a signal that the scrolled windows child may listen to and scroll itself.